Since June 2014, when Tesco launched its current account, it has been possible to earn Avios or Virgin Flying Club miles with your day-to-day banking. As of 19th October, Tesco Bank has tweaked its rules and – for new account holders – is no longer threatening to cut your interest rate in April 2019 as long as you pay in £750 per month and have three direct debits going out. I thought it was worth taking another look on this basis. The main reason we don’t cover it much is that Tesco never offers bonuses for moving your banking across. M&S Bank and First Direct have long standing offers of £100+ bonuses for new customers. The current M&S offer is £185 if you keep your account for 12 months. It seemed logical to me that Tesco Bank could afford to offer 10,000 Clubcard points (24,000 Avios or 25,000 Virgin miles) at some point. But, apart from a couple of very tightly targeted trials, there has never been an incentive to sign up. Here is the Tesco Bank website promoting the current account. If you haven’t looked at this account for a while, you may not know that the £5 monthly fee for paying in less than £750 per month has been removed. The account is now free for everyone. How do you earn Avios with the Tesco current account? The ‘1 point per £1’ spent in Tesco is a very generous benefit. If you are spending £100 per week in Tesco, which includes Tesco Fuel, you would earn 12,480 Avios or 13,000 Virgin Flying Club miles per year if you put all of this spending onto your debit card. That is on top of the base Clubcard points you would receive irrespective of how you pay. This is a pretty attractive deal. Even the ‘1 point per £8 spent elsewhere’ is attractive. Whilst you would be better off in most circumstances using a loyalty credit card instead, it is not always possible to avoid using a debit card. There is ‘small print’ attached to the ‘1 Clubcard point per £8 spent on the debit card’. All payments to ‘banks and financial institutions’ are exempt. This means that you cannot pay your mortgage, pay off a credit card bill or pay money into a savings account. It DOES work with payments to the Inland Revenue but that is not something that most people can benefit from. As with the Tesco Clubcard Mastercard, it is worth noting that debit card spending is rounded down to the nearest multiple of £8. A £7.99 lunch payment will earn you exactly zero Clubcard points. This is a major deterrent unless you are using the card for large transactions. Current account holders receive 3% interest on the first £3,000 in the account. To earn this interest rate, you must pay in at least £750 and have at least three direct debits paid from your account per statement month. Whilst there is no sign-up bonus, the 3% interest paid on sums of up to £3,000 is – given current interest rates – an incentive to get an account. You would receive £90 of interest per year, double the rate of a decent instant access savings account. Foreign exchange use of the debit card incurs a 2.75% fee. The Tesco Bank current account was not competitive when it launched four years ago. Dropping the monthly fee for low earners and introducing the new Tesco earning rate has improved it. If we’re honest, it has also benefited from competitors reducing the benefits on their products. The lack of a moving bonus remains problematical. If you are fed up with your existing bank, turning down £185 from M&S in order to earn a few Avios in the future is not necessarily a great deal. Curve Card has also changed the game a little. 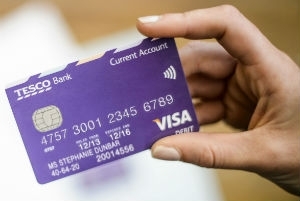 Curve Card is a free debit card (in fact, they pay you £5 for trying it) which recharges your purchases onto a linked credit Visa or Mastercard. In a few weeks you will also be able to recharge Visa or Mastercard debit card transactions to some American Express cards. Making your debit card payments, such as HMRC or council tax, with Curve allows you to earn points on whatever Visa or Mastercard you wish. You can find out more about Curve and how to get your free £5 sign-up credit in this article. Is it worth the trouble of moving your current account to Tesco Bank? For me, I’m not sure. For some people, however, this package may well stack up. If you’re sick of your current account provider it may be time to switch – although, for clarity, you can keep your old bank account open and still take advantage of this deal as long as you move your salary and three direct debits across. You can find out more about the Tesco Bank current account here. I’m getting very confused about the curve card. Do we know when the changes are coming into effect? Any idea what they are – charge for extra limit? anything else, esp AMEX use? What has happened regarding the 200 cash withdrawal and are there issues if it is just used for VAT and corp tax payments? not expecting answers as probably not all known, but maybe a case for an article from Rob on exactly where we are and what we know about upcoming changes? if I’ve missed a similar existing piece apologies, but there still seem to be a number of comments about usage and changes on the site. If you read Ron’s comments it sounds as though all is going to be revealed in a couple of weeks – he won’t be able to announce the changes before Curve does. I know but I can’t tell you, and on that basis can hardly write a speculation article! can you confirm the question below about using the curve to pay other c/cs? Isn’t that the point of the switching service? I think that’s the point though – it IS all done automatically, and it works a treat! Ok – what then stops people from switching?? Inertia over something that is rather unsexy and rather homogeneous to most people. And despite all the CASS marketing, it can still go wrong. I missed an Amex direct debit after switching to HSBC, which was a bit of a pain and dented my credit rating. No financial loss and HSBC threw me a £250 apology, but not exactly seamless. the sort code identifies the bank and branch for transaction routing purposes. so unless the whole UK banking system is changed, I doubt you could carry the same sort code from bank to bank. It could be done. Indeed, the mobile network would be the model for how you would do it. In essence (this is simplified), when you port a mobile number it actually remains within its original block – so the responsibility for that number is still with the original operator (who has the number block). When they receive the call, if it is ported they forward it on to the currently assigned operator. In terms of banking, the most likely way to do it would be essentially along the same lines, force people to provide a redirection / rerouting service to the true location. The difficult bit would be to handle your own internal (to bank) payments to the moved account, but still do-able. And in terms of banking, most things (external) are cleared centrally these days, hardly anything in any sense routes all the way to a branch level in a historic sense. Centralised systems and clearing centres. Sure there is lots of horrible legacy tech, with hardcode that has to be worked around. But, in some respects, virtualising the whole thing is the only way out of that – which again lends itself to offering number portability. Otherway to do it would be to offer every mover a new sortcode in a portable block. That would be guaranteed to be portable. NewPSO / Pay.uk actually did a survey on number portablity recently I believe. I’m confused. I have the Curve Black. Can i pay my Amex bill with Curve (linking to the Virgin Atlantic) credit card for example? It tracks as ‘business’–does this qualify for the miles? Does this attract a nasty fee on the Virgin side (cash advance)? so it earns miles or earns no miles? OT the metal curve card is now in the world. Lol – Curve is never OT, irrespective of what title Rob puts on an article the comments are 80% Curve for now! Have done the maths on offset mortgages and never got it to work. They are more expensive than standard mortgages and you need something like 50% of the value of your mortgage sitting in your bank account to get it to be worthwhile. Might work for some people saving to pay large tax bills. But we’re on a 2% fixed for 5 years and no offset mortgage came close to that. Hi Rob, Could you give details about this? Will curve only allow business amex, or non-reward amex? I would think it would only apply to co-branded cards like the BA one due to the lower fees? Rob, I think you need a pinned article for the next couple of weeks entitled “Don’t Ask About Curve”. Maybe you could tell us exactly how long such an article would need to be pinned for? Completely off topic. If I open an BAEC Household-Account and the 3 members have 90000 Avios all together. Is it possible to transfer these 90000 Avios to my individual IberiaPlus-Account? Or only my personal 40000 BAEC Avios? Personal only. Not sure if avios.com HHA creation and disbandment still works given the roll off? Have a Tesco MasterCard (standard) found service excellent and have received several long 0% balance transfer offers over the past few years . Linked to Pay+ to receive the 1 (!) bonus point per £5 till the end of the year . Just received a 10,000 points targeted offer to open aTesco Bank Current Account ???? So, does that mean only on transactions that have already been posted to a Visa or Mastercard debit card, and then using the ‘Go back in time’ feature to recharge it to certain types of Amex cards? That was explicitly mentioned in what I had heard – quite how that.wkuld work either in terms of MCC type or credit score effect is anyone’s guess – but since all of approx zero people worldwide would contemplate ‘topping up’ their PayPal account I expect the only takers for this will be those doing some straightforward brought forward spend to hit a target. So it’s better to have this Tesco Debit card at the £1 = 1 airmile shopping at Tesco then it is the Virgin card which is 0.75miles per £1 ? Yes, because you’re actually getting 2.5 Virgin miles (1 Clubcard point) per £1 spent in Tesco when you use the debit card. So in theory use this card when shopping at Tesco. Use the Virgin Atlantic mastercard when shopping anywhere else. = That’s the best way to bulk up your miles with spending.